Since 2001 we have been building personalized custom mirrors. Our three panel dressing mirrors are used in residential, corporate and retail locations throughout the USA. Our custom three panel mirrors can be made in any size. Full length winged mirrors are very functional dressing mirrors as they allow a full 360 degree visability. 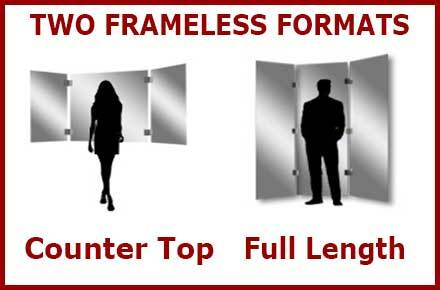 Most three panel wardrobe mirrors can be wall mounted. We fabricate both framed and frameless three panel mirrors. 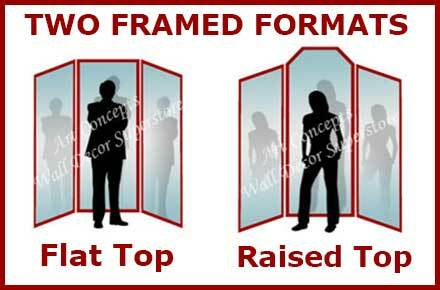 We offer unlimited opportunities in the CUSTOM design of multi-panel wardrobe dressing mirrors. We make them to order and can make them in any size. Small three panel Winged Mirrors can sit on a dressing table - some of our three panel mirrors can hang on the wall - all the large wardrobe mirrors can be used as floor mirrors. Every three way mirror is made In the USA in our Southern California Facility. EZ Shipping - Guaranteed To Arrive Safely. Contact us with you special requests. We can make any size.